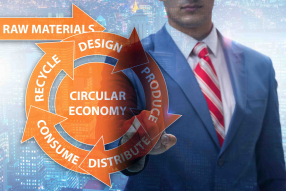 A brand new circular economy 3-day-training programme targeted at businesses working in the automotive and electronics sectors in Romania | February 11th, 12th and 22nd. The training is targeted at businesses and organisations that want to understand how to better manage their resource, materials and energy use in a more circular way associated with the automotive and electronics sectors. Previous knowledge of the circular economy is not necessary, but the participants should have such positions within their companies that could produce impact according to the newly acquired knowledge. Therefore, the attendees should be, but not being limited to, environmental officers, process engineers, product designers, innovation drivers or business managers. If you want to change your products, processes and operations to be part of the circular economy, then this training is for you! A drive to establish a reputation for circular economy expertise. The training aims to help people from businesses and organisations understand the principles behind circular economy and more importantly, learn to deliver activities using circular economy tactics. This will help businesses and organisations become more efficient, save costs and reduce their impact on the environment. The training is intended to change the way people operate by being more aware of their resource use, waste generation and energy use, and create deliverable action plans to operate in a more ‘circular’ way. Climate-KIC is delivering circular economy training as part of its drive to create a prosperous, inclusive, climate-resilient society founded on a circular, zero-carbon economy. It is focussing the training in places where Climate-KIC is already working in to bring varied partners together and direct circular economy actions on particular climate challenges relevant to the area. The circular economy training will compliment other approaches to tackling climate change, as well as increasing knowledge and awareness of new approaches within its existing partner network. The training is delivered by experts in the circular economy from the local training areas. It will be workshop-based and includes tutored presentations, case studies from practitioners delivering circular economy and group discussions to reflect on new ways of operating. The training will provide links to other tools and resources to help participants create their action plans. A resource pack of all training materials and presentations will be available for participants. The first two blocks create an understanding of what circular economy is, why it is necessary, why it offers opportunities for businesses and how it applies to the participant’s sector. Circular economy innovation is an approach to find new and innovative business opportunities that also produce environmental and social benefits. Many case studies will be provided to inspire the participants and show them how similar organisations have delivered circular economy. Blocks 3 and 4 provides participants with insight into implementing circular solutions. They will hear inspirational stories from practitioners that relate to this, as well as analysing barriers and enablers. This allows the participants to understand how to identify key actions for further improving and detailing high level circular economy strategies. It teaches participants how to develop circular economy solutions that are relevant to their industry. The final blocks teach participants how to break down the proposed change into manageable actions that are feasible, and that are both low-effort and high-reward. This provides participants with tools to prioritise actions into short, medium and long term actions and allows participants to understand the importance of verifying assumptions about new activities. Business consultant and Doctoral Researcher on smart cities and smart regions. Nine years in Siemens VDO and Continental Automotive Romania, of which five as quality manager. Former deputy general manager of an important international full-service logistics company. Four years in public managerial and representation jobs, including an elected position at European level. Specialized in regional development, economic development and international affairs. Urban governance and innovation researcher at the Central European University. Systems Innovation consultant of the European Institute of Innovation and Technology (EIT) Climate-KIC. Founder of an urban planning augmented reality start-up and teacher at various educational institutions. His qualifications include engineering and economics. Attila is committed to work towards solving complex sustainability challenges, and to support the necessary transitions to a more circular economy and resilient society. Climate-KIC is Europe’s largest public-private innovation partnership, working together to address the challenge of climate change. It drives innovation in climate change through creative partnerships large and small, local and global, between the private, public and academic sectors. All Climate-KIC partners bring their industry experience to the community and are connected through the centres across Europe. Timis Chamber of Commerce, Industry and Agriculture’s purpose is to represent and support the interests of the local business community, being involved in the implementation of actions aimed at ensuring, at regional level, a solid business environment, collaborating with the institutions and authorities of the public administration, as well as with the regional structures, in order to develop the economic and social activities, including public-private partnerships. CCIAT, through its Technology Information Center, an accredited organism body of ANCS - National Authority for RDI can provide services (TTI audits, business consultancy, Patent and trademark consultancy) for SMIs, startups, internationalization and innovation in business process of organizations. We provide planning for innovation and creating the right business environment to develop company ideas (investment plans, business plans, feasibility study, market research, courses and trainings, human resource management, project management, entrepreneurships, management of innovation etc. ), training and courses for SMEs, support for innovative businesses – TTI mission, economic missions, match making events, company presentations, study visits, common stands in fairs and exhibitions (local, regional, national and international). This training course is part of a new training programme that Climate-KIC is aiming to introduce to reinforce the role that the circular economy has to tackle climate change. The first edition of the training will be deeply evaluated to improve the direct benefits that participants can achieve by attending the course and delivering circular economy tactics. As part of the evaluation objectives, grants and sponsorship have been secured to allow the first edition of the training to be delivered at no cost to the participants. Participants will be expected to actively support the evaluation work and help shape the rollout of the circular training later in 2019. This does mean that training places are limited and applications will be assessed as they come in. The deadline for application is 1st of February 2019. The training venue is downtown, in Piata Victoriei. Therefore, it is very easy to reach this location by any transportation means. The only issue is finding free parking lots, in case of coming with personal cars or traffic jams sometimes. Therefore, enough time should be allocated for solving this.